After our dinner at Quan Hotpot Restaurant (寬巷子) near Shilin MRT Station, we got onto Taiwan’s High Speed Rail 台灣高鐵 and made our way to Taichung. The distance from Taipei to Taichung by High Speed Rail is about 160km, but it took just an hour to get there! I wish we had High Speed Rails in Singapore! It takes a bloody hour to get from Pasir Ris to Boonlay for god’s sake, and that’s only 36 km! Of course, the price is very different. The trip from Taipei to Taichung cost NT700 which is about SGD$33. But still, sometimes it would be nice to have a choice. After our massive eating the last 2 days, Day 3 of our Whirlwind Trip to Taiwan courtesy of iSee Taiwan Foundation turned out to be a very hands-on day, of which I am quite thankful. I’m going to be blogging about Carton King Creativity Park first, which is where we had our lunch. Will blog about our coffee roasting and sampling experience in the upcoming post. 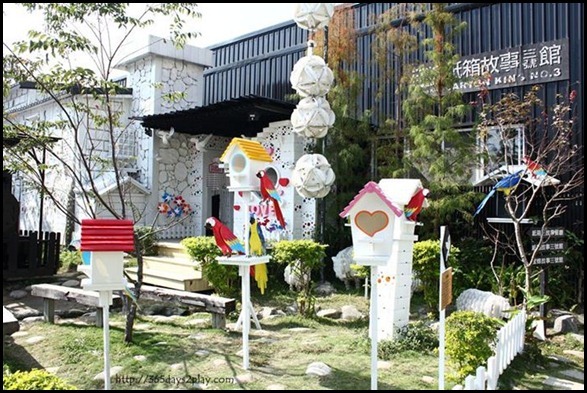 Carton King Creativity Park is a pretty little garden with adjoining restaurant, honey store and souvenir store. As the name suggests, cartons are the rule here. It’s actually quite unbelievable that most of the things you see here are really made of cardboard! Carton King has been in the paper industry for more than 20 years, engaged in the development and design of paper. They have more than 2000 products and over 100 patents. 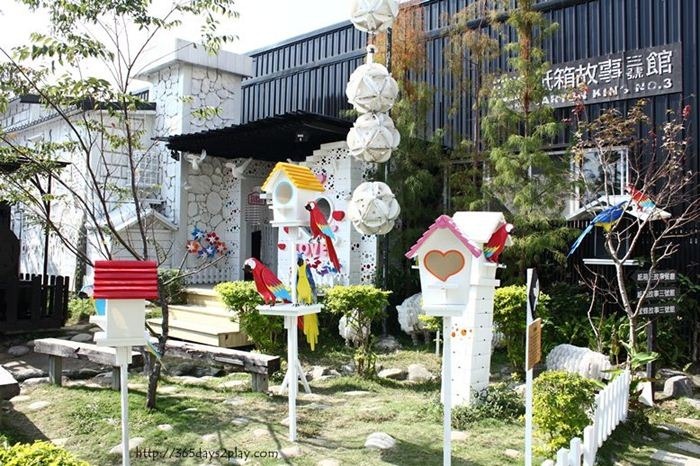 So it was only natural that they showcase some of their interesting and creative designs in their very own park. 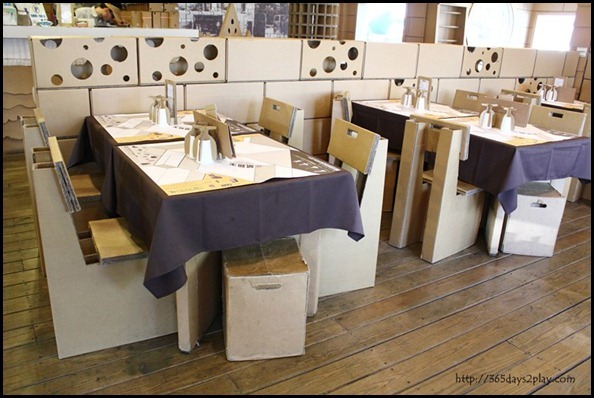 Check out the tables and chairs in Carton King’s restaurant. They are all made of cardboard. We tend to think of paper materials as being rather flimsy and easy to tear apart. However, if you pack them together into thick cardboard form, they hold their strength pretty well! I was just a tad apprehensive sitting down for the first time, but you soon forget that they are not “real furniture”. More about the cardboardy stuff later. First up, LUNCH! Carton King’s restaurant serves up a pretty good variety of food. 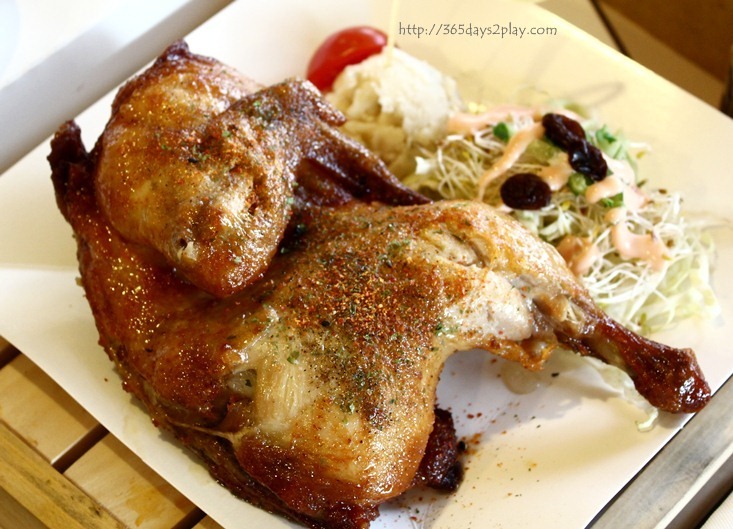 The set lunches are rather affordable, at about NT350 (SGD$15) so that’s what we all had. The set lunches come with mains, side dishes like rice, soup and dessert, and also a drink in a nifty little cardboard box. All the meats are from Taiwan Agricultural Livestock Industry.